First thing to say is that it was a great turnout for the first club ride of the year in what were not terribly pleasant conditions - 13 hardy souls rocked up at Blaise Estate for the 42-mile round-trip to Berkeley, despite a fairly heavy and surprisingly wet mist enveloping everyone and everything! However, lesson #1 was to befall young Joe not very long after the ride got underway - turns out he hadn't felt great prior to leaving home in the morning and he had only had a token amount to eat for breakfast, and unfortunately BOTH of these elements combined to make it a less than enjoyable ride for Joe that had to be terminated prematurely. While Joe's spirit and determination in choosing to come out when he was less than 100% is to be admired, the fact is that we do need to listen to our bodies and if you're under the weather you're always likely to suffer on a ride. And you could also possibly end up being ill for longer than if you'd chosen to rest instead. Rest and recovery are important parts of a cycling regime, particularly so when you know that you're feeling below par, so the lesson to take from this is to heed the signs and, if necessary, take a small step back when you're not well in order to be able to recover more quickly. And setting off for a long ride with little or no breakfast is a big 'No-No' - this is the fuel you'll need to keep you going, so not something that anyone should skip. Insufficient fuelling is asking for trouble somewhere along the way - same as if you set off on a car journey with an empty fuel tank. Chances are you won't make it, so don't do it! Lesson #2. Ian and Joe turned back at Thornbury (hopefully Joe is now recovered, or well on his way) and the remainder of the group continued on their way in conditions that had barely changed from the outset (just a little less mist, perhaps). But it did mean that the road surface was particularly mucky, a point that we'll come back to at the end! Vicky departed for home at this point and the remaining ten members turned around and headed for home. Unfortunately, young Hayden emerged from the cafe and soon found himself feeling cold (despite seeming to have sufficient layers & gloves, headwarmer, etc), meaning that the return leg was particularly challenging and unpleasant for him. It is to his enormous credit that he persevered and completed the homeward journey, but certainly something to be very aware of. So lesson #3, for everyone, might be to ensure that you warm up as much as possible during any cafe stops or similar - particularly if you're prone to feeling the cold. 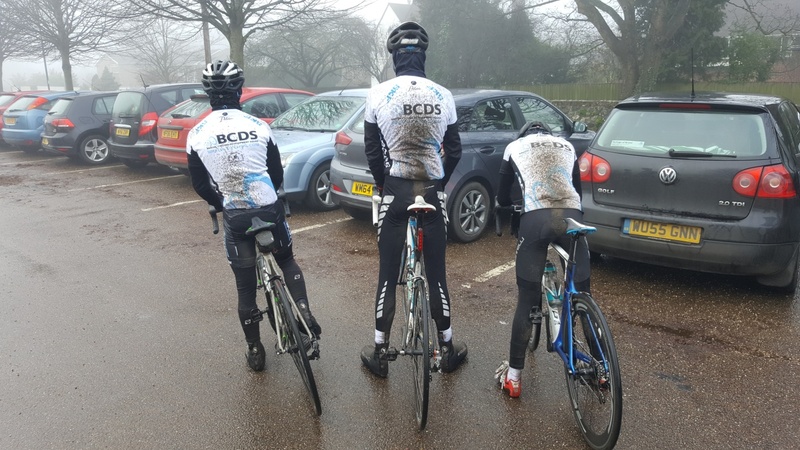 Sadly, my lovely clean white jacket still had to go in the wash because, of course, I'd sat behind some of the 'no mudguard' brigade during the ride so the front of the jacket bore no comparison with the clean back! So the lesson has to be to wear mudguards in bad conditions, for your own benefit AND for the benefit of others on the ride. 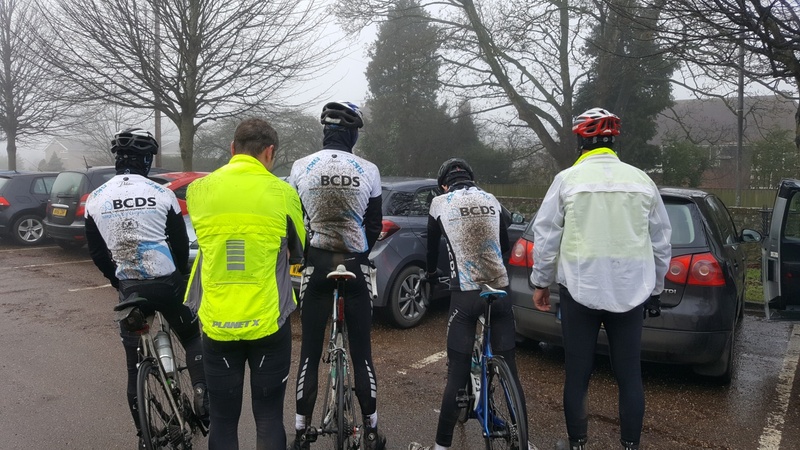 Presumably some of the parents were less than happy at the prospect of returning those filthy jerseys to their usual pristine condition, so they stand to gain too if we see more mudguards on show! Look forward to seeing everyone on the next one!